At the beginning of the 2014 – 2015 academic year, Salem College welcomed Dr. Spring-Serenity Duvall as Assistant Professor of Communication. Following her first full semester of teaching at Salem, Duvall is devoting the spring semester to a selective appointment in Ontario, Canada, as the Fulbright Visiting Research Chair in Transnational Studies at Brock University. She will resume teaching at Salem in the fall of 2015. Selected for the Fulbright Canada program for her work, titled Canadian Celebrity Activism and Transnational Media in the Niagara Border Region; Celebrity Colonialism, Duvall will explore the history of celebrity involvement in politics and social justice movements, as well as the impact that celebrities have on many contemporary issues. Duvall holds a BA in Journalism from the University of Southern Mississippi, a MA in Journalism from Indiana University, and a PhD in Journalism and Mass Communication from Indiana University, where her dissertation focused on celebrity, media, and commodity activism. Prior to coming to Salem, she served as Assistant Professor in the communications department at the University of South Carolina Aiken. Her work has appeared in many communications journals, including Communication, Culture & Critique, Journal of Children & Media, and Critical Studies in Mass Communication. Fulbright Canada is a joint, bi-national, treaty-based organization created to encourage mutual understanding between Canada and the United States of America through academic and cultural exchange. 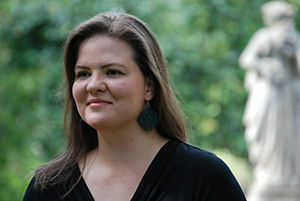 Duvall is one of only twenty-one American Fulbright Scholar Award Recipients for 2014 – 2015 who are participating in the program, along with Canadian scholars.